For those of you who have never heard of it before, MakerBot Industries is a company founded in January 2009 producing an open source 3D printer to democratize manufacturing. MakerBot is a machine that can make you almost anything! That’s right. Using an open source 3D printer plans that are open for everyone to tinker, MakerBot can print you from a plastic toy, to an actual 3D printer of your own. Some say, it is the end of mass production as we know it. So what do people do with the MakerBot platform? Well, here is a nifty environment friendly project: Project Shellter. 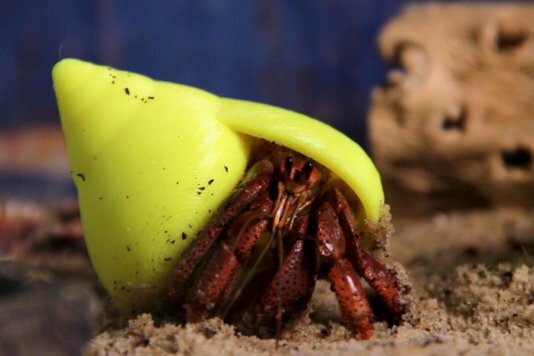 Last year, Makerbot called out to the 3D printing world for eco-friendly replacement shells that could be given to domestic hermit crabs in order to preserve the ocean’s shell supply. Months later, the aptly named Project Shellter has taken off with a line of colorful and funky plastic shell homes for pet hermit crabs. Makerbot offers guidelines that allow anyone to submit their own shell designs so that they can be printed and tested in their lab. Hermit crab owners can also get involved by volunteering to test the newly printed plastic homes on their own pets. Makerbot is continually updating the 3D printing and environmental communities with their blog, chronicling the life and times of cleverly named crabs such as Shelton John and Kendall Karshellian. So far crabs have quickly adopted their new plastic shells, some of which even come in fun colors.